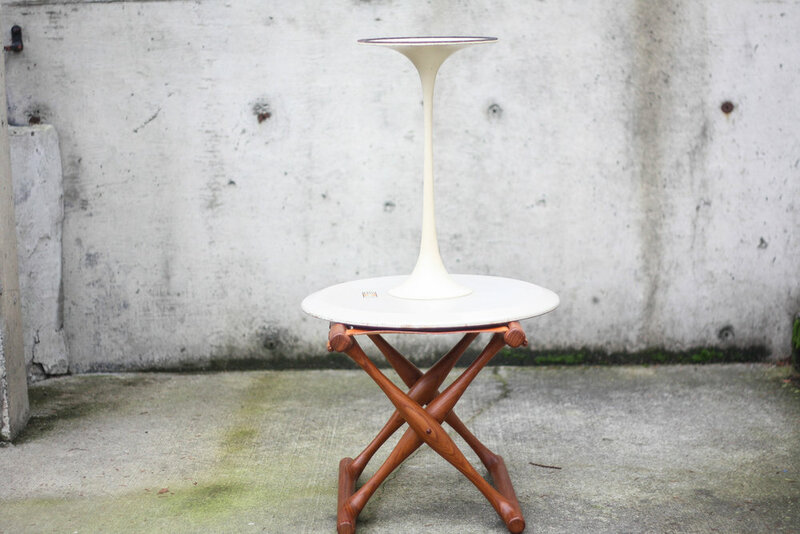 Featured here is an Early version of the Tulip side table designed by Eero Saarinen for Knoll. The Knoll address on the label dates this piece to 1960. The cast iron base means this is a first edition model as later models were changed to aluminum bases. The white laminate top shows beautifully with virtually no signs of wear to the top surface, and a subtle patina to the knife edge. One could easily paint the edge to have a mint top, but we think it's unnecessary as this perfectly balances vintage history with excellent condition. The cast iron base sits level, is extremely heavy, and also shows very subtle markings. Original Knoll Associates Bowtie label still attached to underside authenticating this piece as real deal vintage.